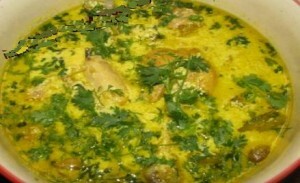 Kashmiri Chicken Curry recipe by Batul Khan at PakiRecipes.com. In hot oil add sliced onions, peppercorns, cardamoms, and cinnamon sticks. Cook until the onions are clear and slightly golden brown. Then, add the ginger and garlic , while stirring. Then, add the salt ,chilli and paprika powder. When all is mixed together, put in chicken and fry until lightly browned. Gradually, add yogurt while stirring constantly. cover and cook for about 20-25 minutes or until chicken is cooked thoroughly. Garnish with cilantro (dhania) and serve with naans. HINT: After completely cooked,to make it easier to eat, take out chicken pieces and put them in a bowl. Then, put the mixture through a strainer to keep from having to pick out all of the peppercorns and cardamoms and add back to the chicken . Good recipe but racist name..otherwise you would have gotten a four. i love the cooking tips you guys provide, i often try cooking on weekends and my food turns to be really tasty....thanks. yes! I knew it how to cook. I tried it and like it a lot.Just i did not add os paprika powder.I actually did not understood what paprika powder is??? The trick here is to realize oh, someone left out all the dashes. 30-45 minutes preparation tine, 2-3 onions, 5-6 tbsp of yogurt....not rocket science.